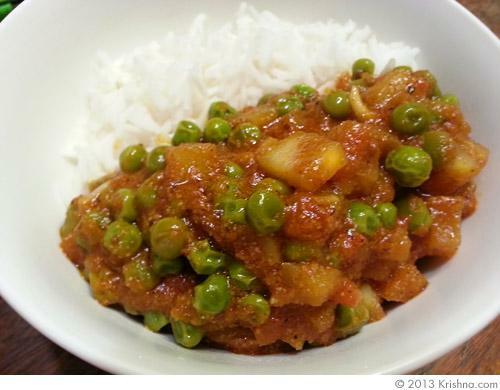 "In France, many Krishna devotees are expert cooks, but Kishori is the best. She often cooked for Srila Prabhupada in India. Srila Prabhupada especially liked matar alu tarkari. In fact, he told Kishori that he could eat it every day." Put the ghee or oil in a large saucepan over medium heat. When it begins to smoke, toss in the cloves, cinnamon sticks, ground cardamom, and bay leaves. Stir-fry for about 30 seconds, then put in the potatoes. Fry them for 5 minutes, frequently scraping the bottom of the pan with a spatula, until they are lightly browned. Add the peas and turmeric. Stir once, pour in the water, and cook for 10 minutes with the pot covered. Then add the tomatoes, along with the grated ginger and nutmeg, the sugar, and the salt. Stir to mix, and cook covered for 5 more minutes. Now fold in the cream, the coriander or parsley, the almonds, and the fried paneer cubes. Remove the whole spices. Heat for a few minutes before serving.